A recent market study published by the company “Invisible Orthodontics Market: Global Industry Analysis 2013–2017 & Opportunity Assessment, 2018–2028” consists of a comprehensive assessment of the most important market dynamics. 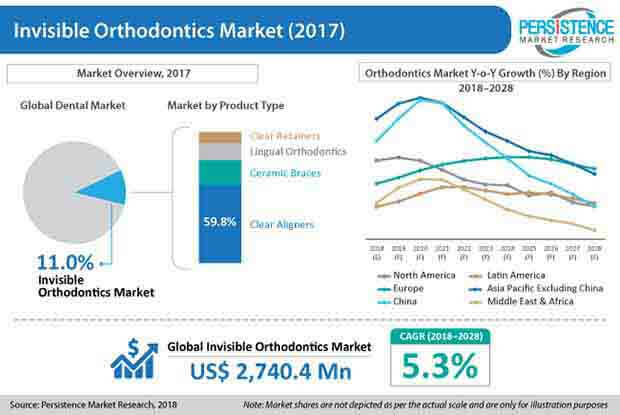 After conducting thorough research on the historic as well as current growth parameters of the invisible orthodontics market, the growth prospects of the market are obtained with maximum precision. The report features the unique and salient factors that are likely to significantly impact the development of the invisible orthodontics market during the forecast period. It can help market players modify their manufacturing and marketing strategies to envisage maximum growth in the invisible orthodontics market in the upcoming years. The report provides detailed information about the current and future growth prospects of the invisible orthodontics market in the most comprehensive manner for the better understanding of readers. The report commences with the executive summary of the Invisible orthodontics market, which includes the summary of key findings and key statistics of the market. It also includes the market value (US$ million) estimates of the leading segments of the Invisible Orthodontics Market. Readers can find the detailed taxonomy and the definition of the Invisible Orthodontics Market in this chapter, which will help them understand the basic information about the Invisible Orthodontics Market dynamics, supply chain, cost structure and pricing analysis. A list of key distributors and suppliers, as well as a list of key market participants is included in the report. This chapter explains how the Invisible Orthodontics Market will grow across various geographic regions, such as North America, Latin America, Europe, Asia Pacific excluding China, China and Middle East & Africa (MEA). Based on the type, the Invisible Orthodontics Market is segmented into Clear Aligners, Ceramic Braces, Lingual Orthodontics and Clear Retainers. In this chapter, readers can find information about the key trends and developments in the Invisible Orthodontics Market and market attractiveness analysis based on the Product Type. Based on the application, the Invisible Orthodontics Market is segmented into excessive spacing, crowding, open bite, deep bite, cross bite, abnormal eruption and others. In this chapter, readers can find information about the key trends and developments in the invisible orthodontics market and market attractive analysis based on application. Based on the age group, the invisible orthodontics market is segmented into Children, adolescent and adults. In this chapter, readers can find information about the key trends and developments in the invisible orthodontics market and market attractive analysis based on age group. Based on the distribution channel, the Invisible Orthodontics Market is segmented into Hospital, Dental Clinics and Orthodontics Clinics in this chapter, readers can find information about the key trends and developments in the Invisible Orthodontics Market and market attractive analysis based on the end user for each region. This chapter includes a detailed analysis of the growth of the North America Invisible Orthodontics Market along with a country-wise assessment that includes the U.S. and Canada. Readers can also find regional trends, regulations and market growth based on the end users and countries in North America. Readers can find detailed information about several factors, such as the pricing analysis and the regional trends, which are impacting the growth of the Latin America Invisible Orthodontics Market. This chapter also includes the growth prospects of the Invisible Orthodontics Market in the leading LATAM countries such as Brazil, Mexico, Argentina and the Rest of Latin America. Important growth prospects of the Invisible Orthodontics Market based on its end users in several countries, such as Germany, the UK, France, Spain, Italy, Russia, and Rest of Europe, are included in this chapter. In this chapter, China, is the prime subjects of assessment to obtain the growth prospects of the China Invisible Orthodontics Market. Readers can find detailed information about the growth parameters of the China Invisible Orthodontics Market during the period 2018–2028. This chapter provides information about how the Invisible Orthodontics Market will grow in the major countries in the MEA region, such as GCC Countries, Northern Africa, South Africa and the rest of MEA, during the period 2018–2028. In this chapter, readers can find a comprehensive list of all the leading stakeholders in the invisible orthodontics market, along with detailed information about each company, which includes the company overview, revenue shares, strategic overview and recent company developments. Some of the market players featured in the report are 3M Company, Dentsply Sirona, Straumann Group, Henry Schein, Inc., Align Technology, Inc., Danaher Corporation (Ormco), TP Orthodontics, Inc., American Orthodontics, DynaFlex, and Bernhard Foerster GmbH. This chapter includes a list of acronyms and assumptions that provide a base to the information and statistics included in the invisible orthodontics market report. This chapter helps readers understand the research methodology followed to obtain the various conclusions as well as important qualitative and quantitative information about the invisible orthodontics market. The invisible orthodontics market is dominated by three major manufacturers - Align Technology, Inc., Dentsply Sirona, and HenrySchein Inc. These manufacturers are competing on the basis of new product launches, improving geographical product footprints, and competitive prices of products. Manufacturers in the invisible orthodontics market are focusing on the expansion of their product portfolios by entering into emerging markets such as India, Brazil, and China. Align Technology, Inc. holds a prominent share of the revenue of the global invisible orthodontics market. Amgen Inc. is the originator of clear aligners such as the Invisalign system. By indulging in acquisitions, partnerships, and collaborations with regional players as well as large businesses, manufacturers in the invisible orthodontics market are focusing on expanding their geographical presence and product footprints in developing countries. The treatment for adult patients is a recent development in orthodontics. There has been increasing demand for orthodontics procedures among adults due to the increasing awareness and understanding of teeth improvement. The increasing benefits of ortho related to periodontics, tempero-mandibular disorders, and restorative dentistry have increased the procedures of orthodontics in the adult populations, which is further boosting the overall market for invisible orthodontics, globally. An increased demand for orthodontic treatment by adults increases the scope of orthodontics, and has widened the age limit for orthodontic interventions, owing to the increasing awareness and desire to improve facial aesthetics, which is expected to drive the growth of the invisible orthodontics market in the near future. The increasing trend and demand for invisible orthodontics has opened a whole new service for GPs to offer the rapidly growing segment of adults in the orthodontics market with slight orthodontic problems seeking to straighten their teeth without the use of traditional wires and brackets. More adults are seeking a straighter smile and choosing newer aesthetic forms of teeth movement options, which include clear aligner treatment and lingual orthodontic treatment. The demand for cosmetic dental treatment, globally, has grown dramatically in the last few years, owing to increased public awareness regarding new techniques, coupled with greater attention towards smile enhancement treatment. A significant increase in dentist using orthodontic appliances to enhance the smiles of patients with misaligned anterior teeth is further increasing the treatment options for patients, which is driving the growth of the invisible orthodontics market, globally. Combining tooth alignment techniques with incisal composite edge bonding and tooth whitening allows dentists to improve the symmetry and aesthetics of a smile in a minimally invasive and affordable way, which further drives invisible orthodontics market growth. Growing awareness among consumer, increasing focus on improved dental aesthetics, growing middle-class population, and rising dental tourism in emerging markets are all further driving the growth of the invisible orthodontics market. This section of the report features the profiles of key players in the invisible orthodontics market based on their market shares, differential strategies, product offerings, marketing approach, and company dashboard. Examples of some of the key players featured in this report include 3M Company, Dentsply Sirona, Straumann Group, Henry Schein, Inc., Align Technology, Inc., Danaher Corporation (Ormco), TP Orthodontics, Inc., American Orthodontics, DynaFlex, and Bernhard Foerster GmbH. Prominent manufacturers in the invisible orthodontics market are focusing on increasing their geographical presence as well as launching new products to increase their revenue sales in the global invisible orthodontics market. Invisible orthodontics is an alternative to metal braces. This is virtually an invisible way of improving one’s smile. Invisible orthodontics are used to straighten misaligned teeth or improve overbite. Invisible orthodontics involve the wearing of custom clear aligners that fit the teeth into a proper position. Invisible orthodontics are comfortable, more attractive, and easy to use as compared to traditional metal braces. The company conducted a research study on the invisible orthodontics market for the forecast period 2018 to 2028. The report offers a comprehensive evaluation of the business opportunities prevailing in the invisible orthodontics market, with insights on the prices, current trends, and reimbursement scenario in the invisible orthodontics market. The report offers a comprehensive taxonomy of the invisible orthodontics market based on product type, application, age group, end user, and region. By product type, the invisible orthodontics market is segmented into clear aligners, ceramic braces, lingual orthodontics, and clear retainers. By application, the invisible orthodontics market is segmented into excessive spacing, crowding, open bite, deep bite, cross bite, abnormal eruption, and others. By age group, the invisible orthodontics market is segmented as children, adolescents, and adults. By end user, the invisible orthodontics market is segmented into hospitals, dental clinics, and orthodontics clinics. The invisible orthodontics market has been analysed across the regions of North America, Latin America, Europe, Asia Pacific Excluding China, China, and the Middle East & Africa (MEA). What is the overall revenue generation potential of the invisible orthodontics market across the regions of Europe and Asia Pacific? Who are the key regional and global competitors? What are their portfolios in the invisible orthodontics market? What are the major challenges influencing the growth of the invisible orthodontics market? The invisible orthodontics market has been estimated based on a supply-demand approach. The market was first calculated based on the procedure volume of invisible orthodontics in different regions/countries. Some other qualitative factors analysed include the awareness level and adoption of clear aligners and braces in invisible orthodontics for different applications. This information is further validated with rigorous primary research (interviews, surveys, in-person interactions, and the viewpoints of seasoned analysts) and secondary research (verified paid sources, authentic trade journals, and resourceful databases). The research study on the invisible orthodontics market also includes the top trends and the macro- as well as micro-economic factors shaping the invisible orthodontics market. With this approach, the report on the invisible orthodontics market estimates the industry attractiveness of every major segment over the forecast period.